Scientology is known for its celebrity believers and its team of “volunteer ministers” at disaster sites such as the World Trade Center; its notably aggressive response to criticism or its attacks on psychiatry; its requirement that believers pay as much as hundreds of thousands of dollars to reach the highest levels of salvation. But for all its notoriety, Scientology has remained America’s least understood new religion, even as it has been one of its most successful. Now Janet Reitman tells its riveting full story in the first objective modern history of Scientology, at last revealing the astonishing truth about life within the controversial religion for its members and ex-members. 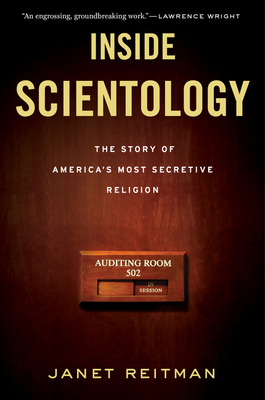 Based on five years of research, confidential documents, and extensive interviews with current and former Scientologists, this is an utterly compelling work of nonfiction and the defining work on an elusive faith. JANET REITMAN is a contributing editor at Rolling Stone. Her work has appeared in GQ, Men's Journal, the Los Angeles Times Sunday Magazine, and the Washington Post, among other publications. She holds a master's degree in journalism from Columbia University, and was a finalist for a National Magazine Award in 2007 for the story "Inside Scientology." "Inside Scientology is an engrossing, groundbreaking work that brings a welcome sense of fair-mindedness to a subject that is, for many journalists and scholars, too hot to touch. Reitman has accomplished the miracle of adding light without heat." "Inside Scientology goes beyond the celebrities and the scandals—though they're here in all their absurdity and horror—to find in Scientology a more profound story about "technology" as an article of faith and faith as a vessel for science, or, at least, science fiction. With precision and empathy, Janet Reitman has in this definitive investigation laid bare the genesis and possibly the endgame of America's strangest religion."